A bowl of tomato soup and a crispy, grilled cheese sandwich is an all-time, classic, American comfort food combination. And, the best version of it involves homemade soup made from just-picked, ripe tomatoes. Comfort food that captures the best of summer seemed like a good idea for a new-mom-to-be looking to stock her freezer with meals before the baby arrives. Ilke from Ilke’s Kitchen has organized a virtual baby shower for Shelley from Franish Nonspeaker. 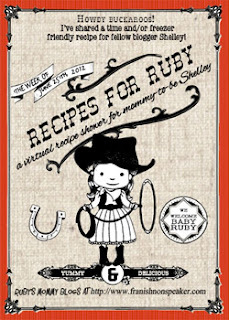 For the shower, a group of us are posting recipe ideas for either freezer-friendly dishes that can be made in advance and stored or dishes that are quick and easy for a busy, new parent. This tomato soup is fairly quick and easy to prepare, but mostly, I thought it would be a great thing to pull from the freezer on a day when there’s no time to cook. The recipe is from Ina Garten’s Barefoot Contessa Back to Basics , and it’s also available online. Crunchy, parmesan croutons take the place of a grilled cheese sandwich here, and they are a delicious topping on the soup along with some fresh basil. Regarding the soup’s texture, it’s really up to you. Ina recommended passing it through a food mill after cooking, but I used an immersion blender. For a smoother puree, you could use a regular blender or a food processor and work in batches. Then, depending on the weather or your mood, you can decide if you’d rather serve the soup hot or cold. 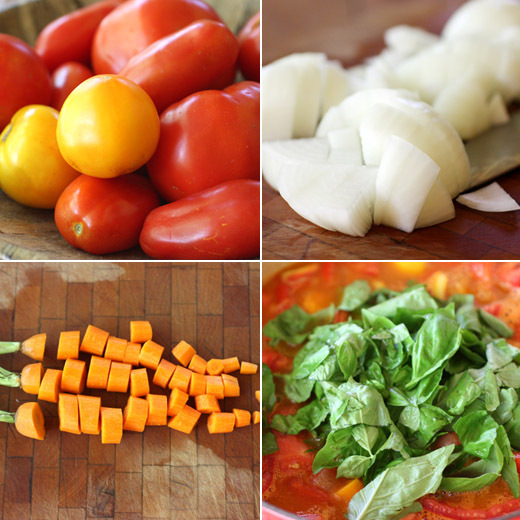 To make the soup, you need four pounds of fresh tomatoes. I used a mix of varieties including big beefsteak tomatoes, smaller yellow taxi tomatoes, and a few San Marzanos from the farmers’ market. The tomatoes should be cored and coarsely chopped. The best thing about a pureed soup is that the ingredients are just quickly chopped for cooking since the shape doesn’t matter in the end. The recipe calls for red onion, but I used some locally grown sweet 1015’s instead. To begin, the onions were sauteed in a large pot with a couple of chopped carrots. When the vegetables had become tender, some garlic was added and cooked for a minute. Next, the tomatoes were added with tomato paste, stock, basil, and salt and pepper. Sugar was supposed to have been added, but I skipped it since the tomatoes were so flavorful, and I used a sweet onion. Also, rather than using the suggested chicken stock, I made a quick vegetable stock to use instead. Even water would work here, but some extra salt and maybe a little more tomato paste would be needed in that case. The soup was brought to a boil and then left to simmer for about half an hour. Just before being pureed, three quarters of a cup of cream was added to the soup. To top the soup, a baguette was cut into chunks, the pieces were tossed with olive oil and salt and pepper, and they were sprinkled with grated parmesan. The croutons were baked until golden and crunchy. It’s actually a sign of a new chapter in my food life that I suggested serving this soup hot or cold. Until recently, I wasn’t a fan of cold tomato soup. While on vacation during the week of Memorial Day, I tried a chilled, smooth tomato soup for lunch one day and actually loved it. Just like this soup, it had some added cream for richness, but the flavor was really all about the tomatoes. And, that soup had some lemon in it that worked to point up the flavors. So, just to test this recipe for all possible uses, I’ve tasted it hot off the stove, chilled from the refrigerator with a little added lemon juice, and thawed and re-heated from the freezer. I can report that it was fantastic every which way and that having a supply in the freezer makes this comfort food meal an easy option whenever you want it. Lisa, oh my a good tomato soup made from summer sweet tomatoes is my idea of heaven! I like your idea of serving it hot or cold. And those crutons look awesome too. Yum! What a great freezer idea-especially since we have so many tomatoes available right now from the garden. I love the idea of replacing the grilled cheese for that crispy crouton too. We love good tomato soup in this house. I love the popping colors. I should take advantage of 69 cents per pound tomatoes at the farmer's market I guess. This is a great one to freeze! Although that Campbell's stuff is classic with grilled cheese sandwiches, it's not very good tomato soup. Homemade is wonderful. I haven't made any for a couple of years, but I've got a bumper crop of tomatoes coming. Think tomato soup will be coming to my dinner table in a few weeks? I think yes! Thanks for this. It looks absolutely gorgeous! What a delightful soup. Yay, I wanna buy lots of fresh in-season tomatoes! Lovely delicious soup. Oh Lisa....I'm so sorry!! Guess what I chose for the "virtual baby shower". Geez....you guessed it...tomato soup. Well, I guess it is technically a minestrone soup but close enough. AAAck. What were the odds of coming up with the same recipe. Well, its good that Shelley just got a huge flat of tomatoes (reading comment above) because she certainly has a queue of recipes for them! 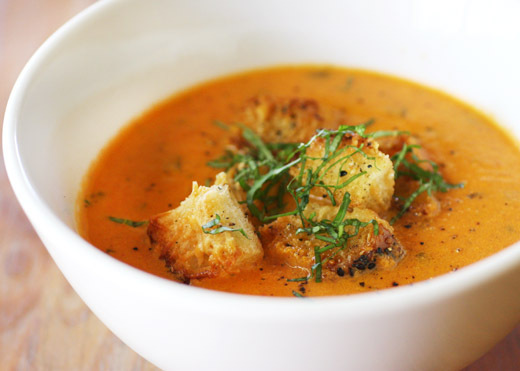 Lisa, this soups looks delicious, creamy and lot of flavors...I love the idea of parmesan croutons...yum! This looks absolutely delicious. I guess I have never thought of eating tomato soup cold, but I will have to give this a try. 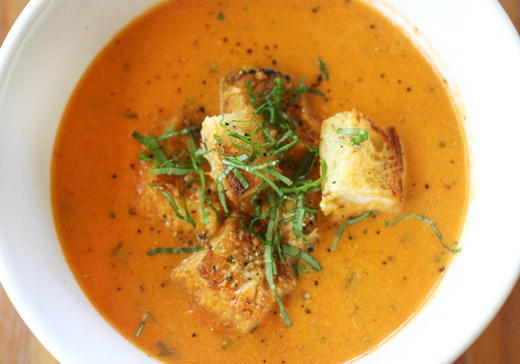 I love the idea of cold tomato soup for lunch in this heat! Fresh tomatoes are amazing on anything, but this soup looks particularly good. I'm hungry again. This is one of my favorite recipes from that cookbook. And, in a pinch or in the dead of winter during my Nebraska days, a couple of cans of really good canned tomatoes were good substitutes for fresh. A very fresh and delectable soup. Looks so good with crunch croutons. I think I go for the hot one. Lisa, this soup is the perfect antidote to the hideous weather we are having here! ANd now I am craving tomato soup with grilled cheese in a MAJOR way. This looks so creamy delicious! Definitely a beauty and who can resist tomoato soup and a grilled cheese. The garnishes look fantastic too. cold soup. Now that is new. Although I'm freaking out at the thought of it, I know I would come to accept it the way you did. I want this for dinner tonight. Looks amazing. The colour is perfect as well. I am very envious! This looks wonderful! Tomato soup and grilled cheese sandwiches are two of my comfort foods and they simply MUST be served together! :) As much as I love tomato soup, though, I have never made it homemade, so I am looking forward to trying this recipe. I have also never eaten it cold, so I am looking forward to giving that a try which will be perfect during the summer months ahead. Beautiful, Lisa. I do love Ina Garten. And I adore cold soups. This would be a natural for me. Wonder how I missed this? And I have the book, too. i feel like fresh tomatoes are rarely, rarely used for tomato soup anymore--good for you! Love this Ina recipe! It's my go to for tomato soup. Yours looks lovely. I love tomato soup during the summer, when the tomatoes are fresh! Yum! This soup tastes and looks like summer!